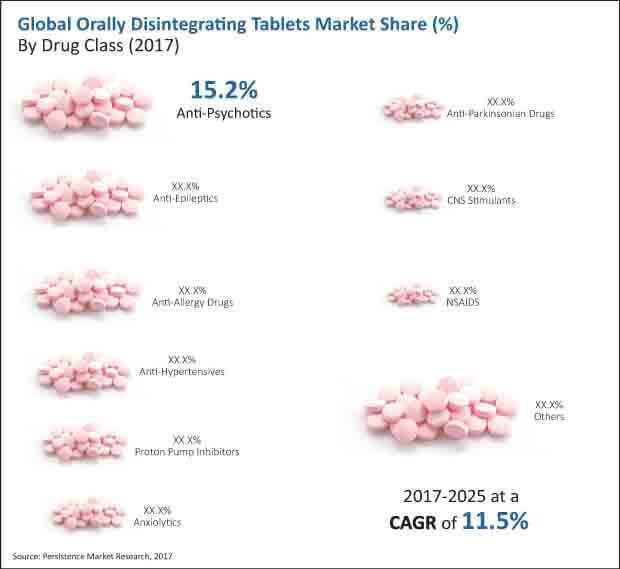 An opportunity analysis of the global orally disintegrating tablets market reveals interesting prospects for manufacturers of orally disintegrating tablets to focus on developing newer therapies and products to increase global acceptance by consumers. Key takeaways from an in-depth assessment of the global orally disintegrating tablets market carried out by Persistence Market Research along with regional and segmental forecasts have been published in a new report titled ‘Orally Disintegrating Tablets Market: Global Industry Analysis 2012 – 2016 and Forecast 2017 – 2025.’ The report covers the historical forecast (2012 – 2016) of the global orally disintegrating tablets market across the assessed regions and based on the market segmentation as highlighted in the report. This historical analysis serves as a reference point for a comprehensive assessment of the global market for the current year and over the forecast period (2017 – 2025). Our report on the global orally disintegrating tablets market follows a systematic and cohesive structure that enables the reader to move through each section in sequence to understand every aspect of the market captured in detail through extensive research. The initial chapters including the executive summary (comprising the market overview, analysis, and our recommendations), market introduction (comprising market definition and taxonomy), and the global orally disintegrating tablets market opportunity analysis (featuring the macro-economic factors and value chain analysis) provide a panoramic view of the global orally disintegrating tablets market. The subsequent section comprises dedicated chapters on the performance and analysis of the regional orally disintegrating tablets markets with detailed information on the market dynamics, historical and current market size forecast of the various countries and across the different market segments, an impact analysis of the regional drivers and restraints, and a market attractiveness analysis. A list of key representative market participants along with their market presence (intensity map) concludes these chapters. The next and most important section focuses on the competitive landscape of the global orally disintegrating tablets market. This section outlines the market structure, market share analysis, and a competition dashboard that provides a singular view of the competition ecosystem of the global orally disintegrating tablets market. Detailed company profiles of the leading companies operating in the global orally disintegrating tablets market are highlighted here for the benefit of the reader. Company profiles include an overview of the company, key financials, business strategy highlights, a SWOT analysis, and recent developments in the global orally disintegrating tablets market. The last section comprises a historical analysis and forecast of the global orally disintegrating tablets market by region, drug class, disease indication, and distribution channel. Here, we present key market findings, historical market size and trend analysis for the period 2012 – 2016, current market size and forecast for the period 2017 – 2025, market attractiveness analysis, Y-o-Y growth, and absolute $ opportunity analysis. Our in-depth assessment of the global orally disintegrating tablets market is underpinned by an extensive research methodology that factors in both primary and secondary research to acquire the relevant data points pertaining to the global orally disintegrating tablets market. This data passes through multiple validation funnels and is analyzed in depth using our patented tools to glean relevant qualitative and quantitative insights into the global orally disintegrating tablets market. In line with a World Health Organization directive, pharmaceutical companies across the world are making a calculated move from solid dosage forms to orally disintegrating tablets, mainly due to increased acceptance of orally disintegrating tablets (ODT) among patients of diverse age groups. Orally disintegrating tablets are used by physicians to provide accurate dose combinations to patients. ODT mini tablets are the latest innovation in the drug class segment, and these combine the convenience of solid dosage forms with increased stability to enable ease of administration, especially in pediatric use. A rising awareness of the benefits of administering orally disintegrating tablets is fueling revenue growth of the global orally disintegrating tablets market. Manufacturers in the orally disintegrating tablets market are leveraging advanced techniques to manufacture orally disintegrating tablets and are thereby looking to tap into the hitherto untapped market opportunities. There is a greater acceptance of this drug class over conventional solid dosage forms among patients of different age groups and this presents new market opportunities for manufacturers. Further, manufacturers of ODT are taking advantage of product life cycle extension by launching their drugs in different formulations. Also, a high penetration among end users in developed countries will boost the global demand for ODT in the foreseeable future. Owing to technological advancements, manufacturers are focusing on increasing the applicability of ODT technology to different therapeutic areas. This factor is likely to further augment revenue growth of the orally disintegrating tablets market during the forecast period. Among the drug class category in the orally disintegrating tablets market, the Anti-Psychotics drug class segment is likely to beat the other segments in terms of market value share by the end of the forecast period. From a market value share of about 15% estimated to be held in 2017, the Anti-Psychotics segment will account for about 20% market share by the end of 2025, leaving all segments behind. A market value of roughly US$ 1.7 Bn for Anti-Psychotics drugs is estimated in 2017 and this will increase to about US$ 5.6 Bn by the end of 2025, registering an impressive CAGR of 15.7% during the forecast period – the highest among all the drug class segments. The Anti-Psychotics drug class segment dominated the global orally disintegrating tablets market in revenue terms in 2016 and this trend is projected to continue throughout the forecast period. The Anti-Epileptics drug class segment is expected to be the second most lucrative segment in the global orally disintegrating tablets market, recording a market attractiveness index of 1.4 during the forecast period. The Anti-Epileptics drug class segment will hold a market value share of just under 13% by the end of 2025. North America: Advancements in improved oral protein delivery technology through ODT will promote the adoption of protein and peptide based therapeutics. ODT in the North America healthcare market are manufactured using patented technologies such as fine particle coating or adding sweeteners into the tablet matrix for taste making, granulation, spray-drying, freeze-drying and molding. The flexibility of orally disintegrating tablets allows molecules of a wide variety of doses and chemical characteristics to be incorporated into an ODT. Latin America: Manufacturers of ODT in Latin America are focused on innovations such as controlled ODT drug release by changing their excipients. ODT technology is applicable in a wide range of therapeutic agents including generics, thereby adding value, i.e. ‘super generics’ for veterinary or human applications. Manufacturers in Latin America are leveraging ODT technology to strengthen their product portfolio through product line extensions. Europe: Companies in the Europe market are adopting nanocrystal technologies to manufacture highly potent and hazardous material as these technologies help reduce the number of steps such as granulation, blending, and tableting. The nanocrystal technology has been patented by Elan Corporation Plc (acquired by Perrigo Company plc).